From Amit Agarwal, a great summary of what the differences are between 1.0, 2.0, & 3.0. Web 1.0 - That Geocities & Hotmail era was all about read-only content and static HTML websites. People preferred navigating the web through link directories of Yahoo! and dmoz. Web 2.0 - This is about user-generated content and the read-write web. People are consuming as well as contributing information through blogs or sites like Flickr, YouTube, Digg, etc. The line dividing a consumer and content publisher is increasingly getting blurred in the Web 2.0 era. 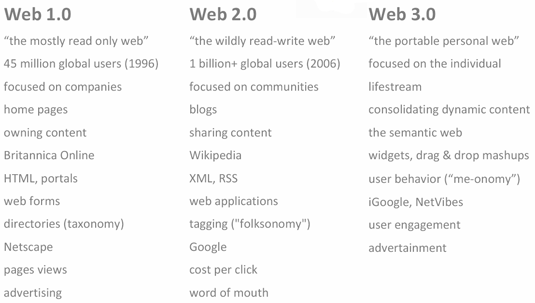 Web 3.0 - This will be about semantic web (or the meaning of data), personalization (e.g. iGoogle), intelligent search and behavioral advertising among other things. Amit has collected a bunch of different industry presentations that make these various points.